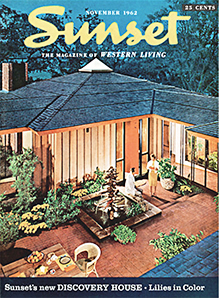 In the postwar, Sunset magazine thrived on publishing the work of young, up-and-coming architects, several of whom benefited greatly from publication. They include Roger Lee and his Newton house (above), Yreka, 1958. Henrik Bull and his Sunset-sponsored 'Discovery House,' El Dorado Hills, 1962. Throughout the late 1960s and early 1970s, Sunset kept up with changes in housing, architecture, and society, writing about the Sea Ranch in the late 1960s and about the new phenomenon of clustered condos everywhere. When done well, clustering fit Sunset's long-held belief in efficient use of space and proper orientation of homes for sun and views, and the use of fences for private indoor-outdoor living. "The new privacy changes coming now in subdivisions result in more usable lot land and new privacy out of doors," Sunset wrote in April 1969 about clustered homes. But, the magazine, warned, "for this concept to work, whole groups of houses must be related to one another." By the start of the ‘70s, Sunset's approach to modernism was no longer a crusade. Modern homes still appeared—but images of traditional homes began slipping into spreads about kitchens, decks, and cooking. By 1981, when Dan Gregory began working at Sunset, he says, "It had become much more focused on remodeling, because most people were not building new houses. They were remodeling." Still, he says of Sunset today, "I think you can say there's definitely a modern approach."